I am like a squirrel in the fall. I am finding plants that I want to bring in or start for the winter. Some of our summer annuals make a nice addition to the house for the winter. The Sweet potato vines that swallowed the shrubs in front of the Combined Services Facility (CSF) are well behaved as house plants, as are “Moses in the Cradle,” some of the ferns. Most vines like Sweet potato, Ivy, and Moses in the Cradle are easy to start by cuttings rooted in water. Some of the “Wing Type” Begonias we use can be cut to ground level and potted as house plants or make stem cuttings with at least two growth nodes and maximum of two leaves. This is also a great time of year to start new house plants such as African Violets and Rex Begonias. These are usually started with leaf cuttings. Leaf cuttings are a little more challenging that sticking a vine in a shot glass of water and waiting for the roots to pop out. They usually take a moist potting medium in which you put the cut end of the leaf stem. These take a little longer and need to be watched more carefully for watering. One of the important things to do when bringing a plant from outside into your home is to make sure that you are not bringing along any unwanted “guests” like spider mites or aphids. Any plant that you want to bring in the house needs to be cleaned. The easiest way to manage this is to trim off as much of the plant as possible. This helps in having more new growth that is acclimated to the household growing conditions as well as less area to bring in “guests.” Once you have trimmed the plant, you should clean it. Most plants handle a washing with a light dish soap and water solution-about 10 drops in a quart of room temperature water. You will need to wipe off the tops and bottoms of the leaves as well as the stems. If you plan ahead you can put a hose end sprayer with a little dish soap and spray them down outside while the weather is still nice. At this time, you can also rinse the soil. You make a fresh batch of the soap solution and slowly pour it through the pot so that all the soil gets rinsed/saturated. This same procedure works well for controlling the mid-winter house plant pest explosions. The stress of tropical plants living in a home environment can lead to insect problems. The four main pests are Aphids, Mealy Bugs, Spider Mites, and Fungus Gnats. Aphids, Mealy Bugs, and Spider Mites can be controlled by hand-washing the plants with soap and water along with some changes to the normal care of the plants. Fungus Gnats used to need a long-term control or use of pesticides in your home. Now we are lucky enough that one of the local Big Box Stores (with a name starting with “M”) sells the best and safest cure. They now sell “Yellow Sticky Cards.” They look like plastic yellow “Post-Its” that are very sticky on both sides. You insert them into a stick holder and put the holder in the pot with your plant. The Fungus Gnats are attracted to the color and then stick to the cards. We all see the “Holiday Plants” that are for sale this time of year. Here is a quick rundown of some of them and their care. These plants are colorful, but not the best house plants. The white sap can irritate your skin, cause problems if ingested, and is NOT good for kids or any pets. They are EXTREMELY time consuming to bring back into color. These are beautiful trees. In southern Florida these are enormous beautiful trees. They like to have bright sunlight and to grow evenly, but they need to have their pot turned a few times of year so they do not lean. They like to have their soil dry out between watering. They cannot handle Illinois winters, so do not put them outside in the winter. These plants are a result of the breakthroughs in plant cloning technology about a century ago. Orchids are a HUGE group of plants. The main type we see for sale is the “Moth Orchid” (Phalenopsis species). These are easy to care for and rebloom. In the wild these are epiphytes growing in the trees of the tropics; an epiphyte is a plant that uses another plant for support but does not take any nutrients from the host plant. This helps explain why they do not grow in soil and are so sensitive to over watering. Their roots need to dry out. They can usually recover from under watering but NEVER recover from over watering. The easiest way to get them to rebloom is to set them outside in the summer in complete shade. You can lightly fertilize them during the summer, bring them in before we start getting 40 degree nights. New flower stems will eventually emerge, and you will have a nice reblooming orchid. These are my favorite house plants. Yes, they are real cactuses. In the wild they grow as epiphytes in trees. They are easy to grow and bloom. They enjoy bright sun in the house but are not picky. They like to stay evenly moist but are not too sensitive about drying out. 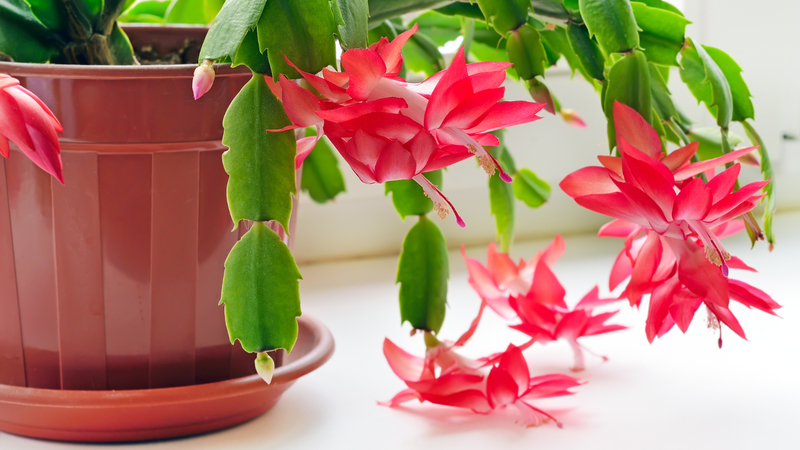 They will rebloom-but blooming will be around Thanksgiving – I guess we can call them Turkey Trot Cactus. Getting them to bloom for Christmas is a greenhouse trick. Corey Zak is the Palatine Park District’s Horticulture Manager. Cory has won awards for his designs and work. In recent years he has worked on making Palatine Park District landscape practices more pollinator friendly and helping to introduce plants to the public that are beneficial to pollinators as well as having ornamental qualities.